Today you may be more concerned with running into a Zombie or how you are going to make that sheet look like a ghost costume. 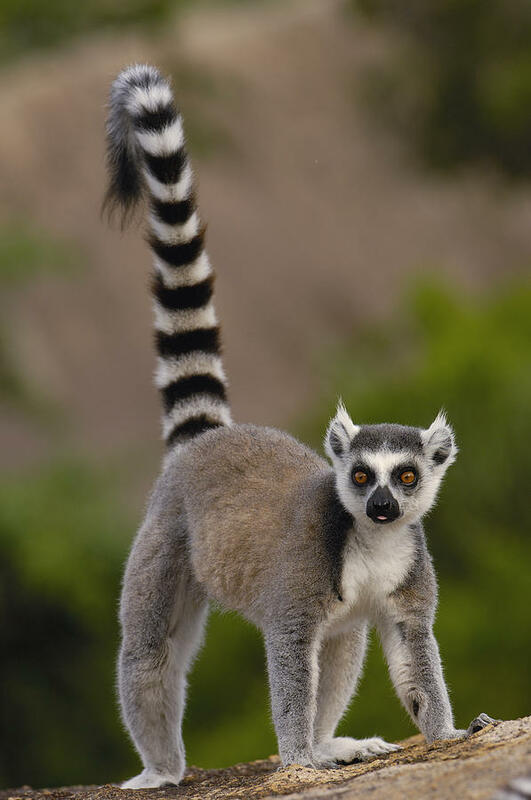 What you may not be aware of is that today is also World Lemur Day. 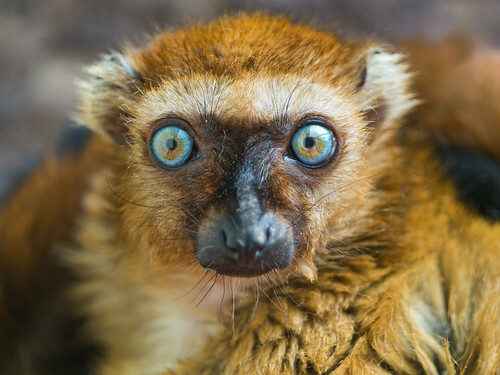 If you are reading this and thinking "what the hell is a Lemur" well fear not, because one of my friends has decided to write me an entire guest post on...... yes you guessed it Lemurs; enjoy! The Lemurs, by Sharon White. Out of all the primate's the Lemur's are the most diverse. 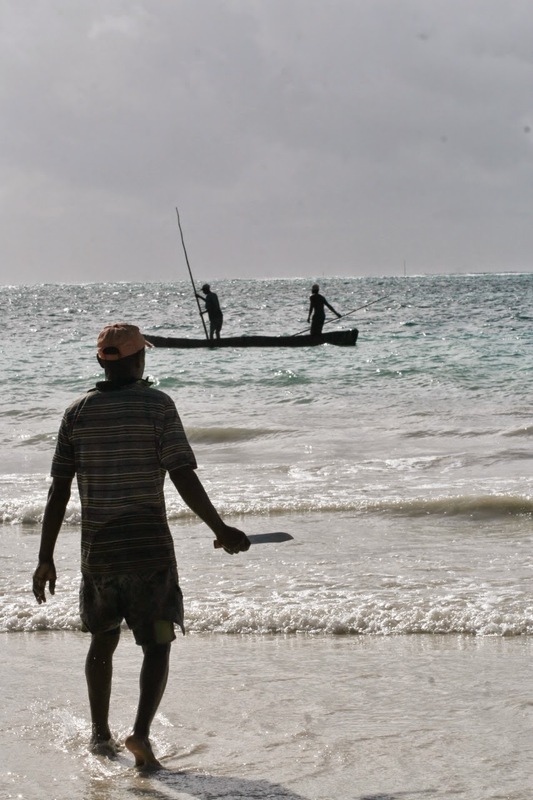 Anyone who watched the BBC's “Madagascar” would've been enthralled with the footage showing off the primates that are only found on the island. With nearly 100 known species that live in all areas and all habitats of Madagascar, Lemur's have a lot of weird and wonderful physical and behavioural adaptations. 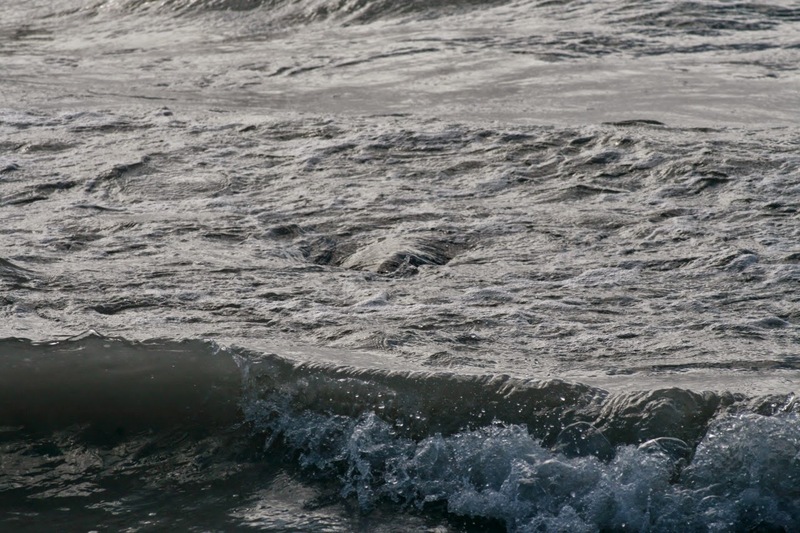 Some of the species are nocturnal, active only in the daylight or both. Their diet ranges from fruits, leaves and bamboo to nectar and insects. 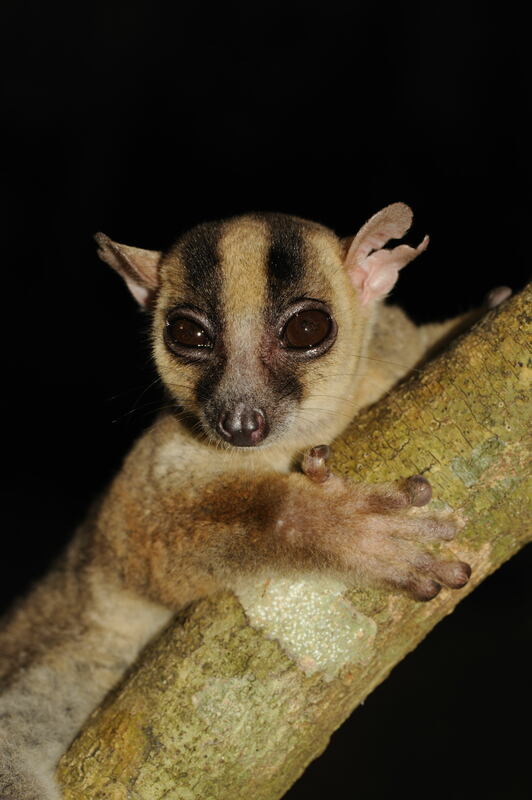 Their physical sizes range from the smallest of primate species' Mouse Lemurs being a tiny 1oz, to the Indri at about18lb's. Social behaviours range from solitary lifestyles, monogamous pairs and large, complex social groups. Throughout the Lemur's, female dominance is typical and is found in very few other primate species and even rarer throughout mammals. 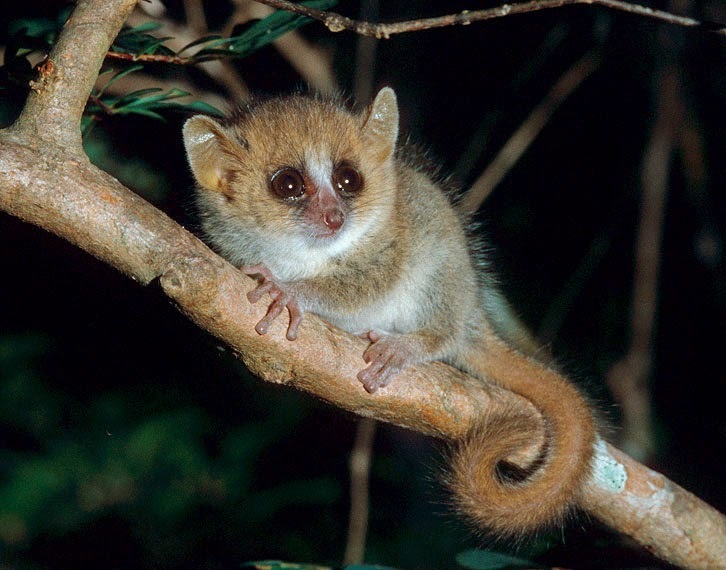 Mouse, Dwarf and Fork-marked Lemurs are known for having seasonal periods of torpor, like hibernation, especially during the dry season when food supplies decrease. As is common with hibernating species, it's common for individuals to fatten themselves up and these small primates, increase volume in their tails (a fat reserve) before going into seasonal torpor. 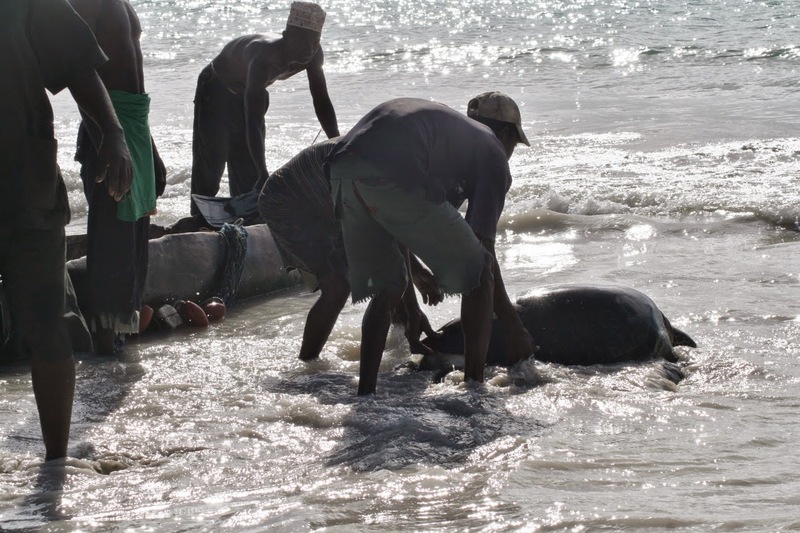 However, this activity varies even on a population level, some individuals can go into torpor and others will not. Dwarf Lemurs hold branches and pick objects in between their second and third fingers, which is in contrast to the other Prosimian species and more like their South American cousins. 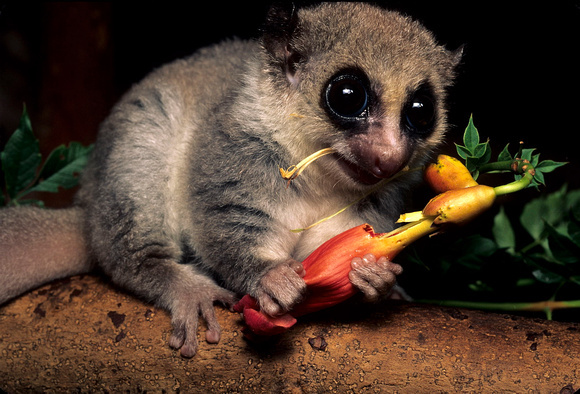 Sportive Lemurs are the smallest folivorous primate, which is a rare diet for a nocturnal mammal. 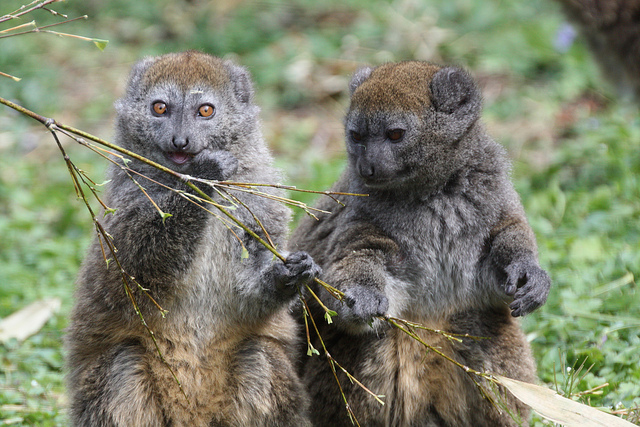 The lack of sugars in their diet has meant that Sportive Lemurs have small home-ranges and short travel distances. The Lac Alaotra Bamboo Lemur is unique, amongst all primates, as it is restricted to marshland surrounding Lake Alaotra in eastern Madagascar and live amongst the stands of reeds and papyrus. 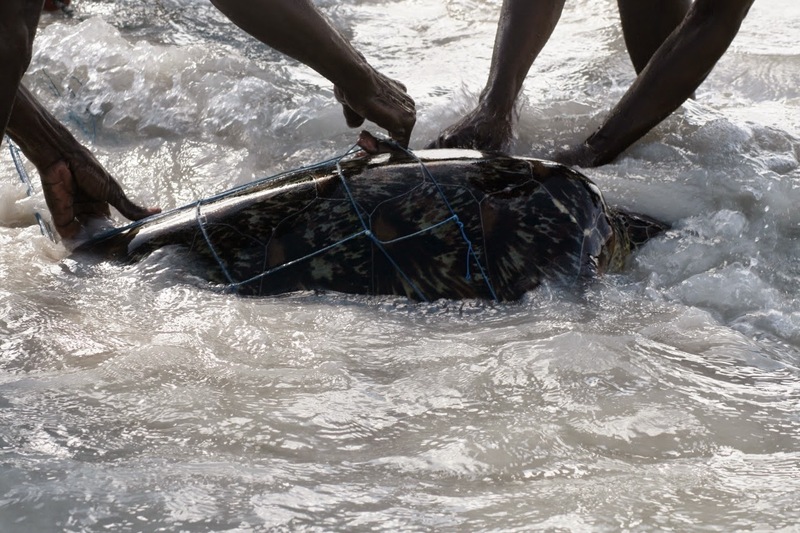 There are two sub-populations for this species and are thought to swim. 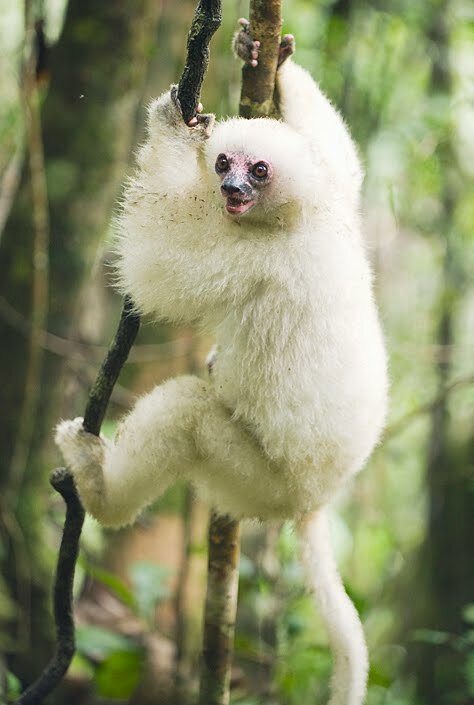 There is one species of Lemur, which is my personal favourite, that have blue eyes. The Sclaters Lemur, aslo known as the Blue-Eyed Black Lemur, is the only primate other than humans to be born with blue eyes. Lemur species are amongst the most endangered species in the world. Six species are on the top 25 most endangered primates in the world. 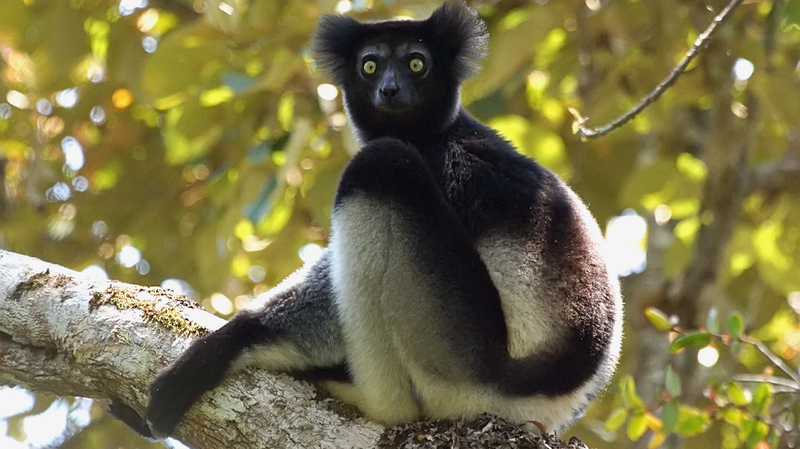 Those species include the Red Ruffed Lemur, Blue-Eyed Black Lemur, Northern Sportive Lemur, Silky Sifaka, Madame Berthes Mouse Lemur and the Indri. 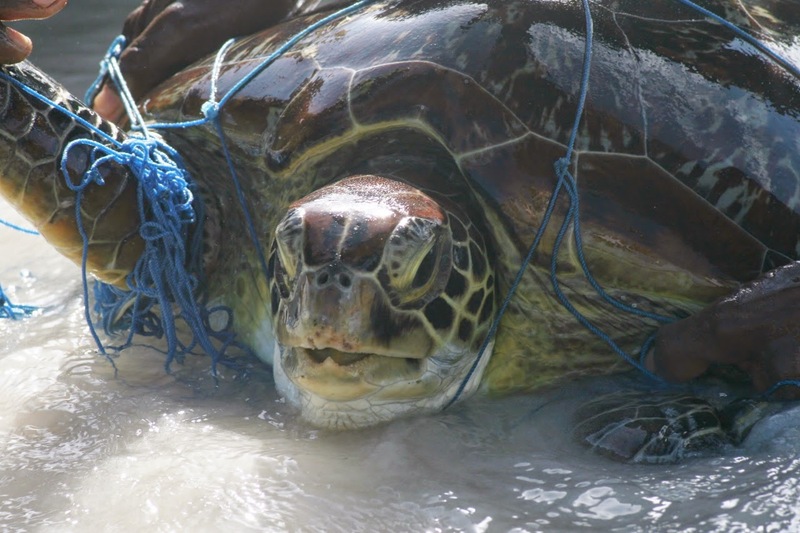 All these species are very different in their shape, size, diet and habitat, but all populations are declining due to habitat loss and hunting, amongst other things. Despite, the small amount of information provided here, you can see how amazing these primates are and how we really need to help protect them for future generations! To learn more about how you can help the Lemurs check out the Duke Lemur Center. Sharon White is passionate about primates and wildlife in general, but she simply adores Lemurs. Sharon spends her time wither working as a photographer or with the Cheshire Wildlife Trust, passing on her passion for the natural world. 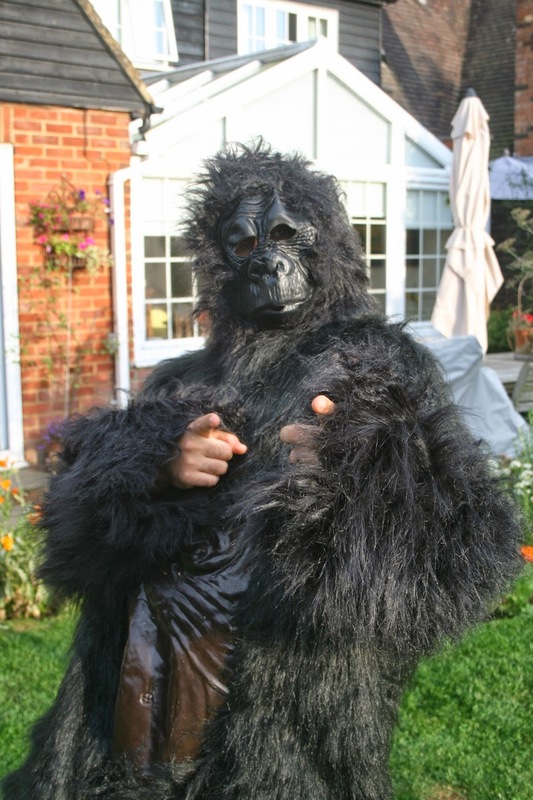 "The views and opinions expressed in the Diary of a Primatologist blog (except guest posts) are purely my own and are not in any way linked to any organisations I may represent or work with unless otherwise stated. All photos are my own unless otherwise stated and a source will be provided where other photos are used. If they are your photos and you would like them removed please just ask. The author retains full copyright for all content and photos and written permission is required before their use. 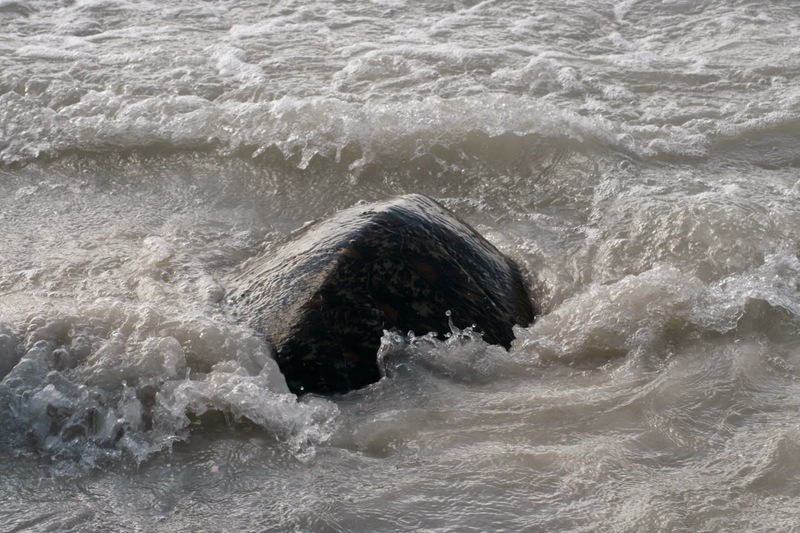 The owner of the site is not liable for any content accessed through links posted." I don't know about you, but I love Autumn. I love the bronzing of leaves and the crunch of walking over them, I love the drop in temperature, but still the warm glow of the sun. I love the first frost and seeing your breath as you walk along a country lane. However, what I love most is the stews, pies and soups; oh yes the joys of One Pot Cooking! People sometimes don't realise how quick and easy (and nutritious) soup can be. You have your classics, Tomato, Carrot & Corriander, Potato & Leek, what do they all have in common? Cheap, easy and based on healthy, colourful vegetables. Today I want to elevate the Celeriac to first place and show off its earthy, nutty brilliance. The WHAT? I hear you say. 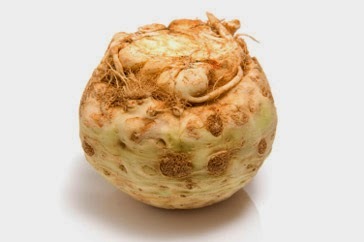 Yes the Celeriac, you have probably walked past it 100 times in the supermarket, well now it is time to dig deep and buy this weird looking bulbous vegetable, because its cheap and extremely tasty. Did you know that the Celeriac is related to the Carrot and packed full of goodness like Vitamin K, which is important for your bones. Also, it has been linked with helping against Alzheimer's disease having anti-cancer properties (1). This soup took me perhaps 20 minutes start to finish and as I doubled the recipe it could feed 3-4 adults. All you need is celeriac, potatos, celery, garlic, onion and some seasoning. It could not be easier and you have no excuses to not give it a go. Also when you whiz it up you get a nice thick creamy texture that I just love. Just pop it into a bowl, sprinkle some black peper & chives on the top and away you go. Why not enjoy it with some crunchy, wholesome farmers bread? 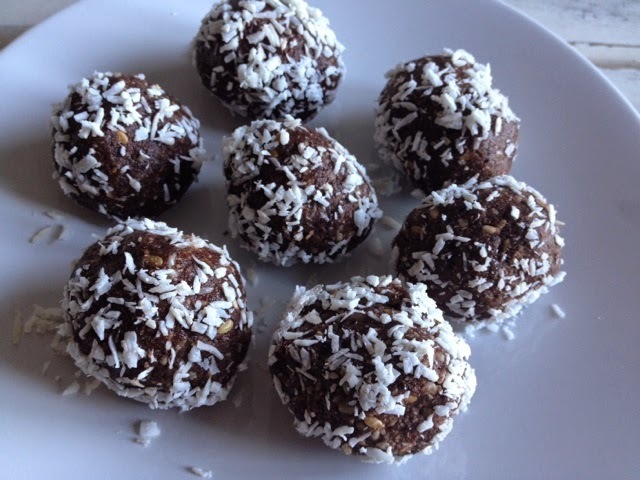 Home made Raw Energy (Monkey) Balls, great for protein. I have decided to start blogging about food every so often. Mainly cause I enjoy cooking and sharing the recipes that I have found with others. Also, as a vegan I want to show people how easy it is to make delicious dishes without animal ingredients. 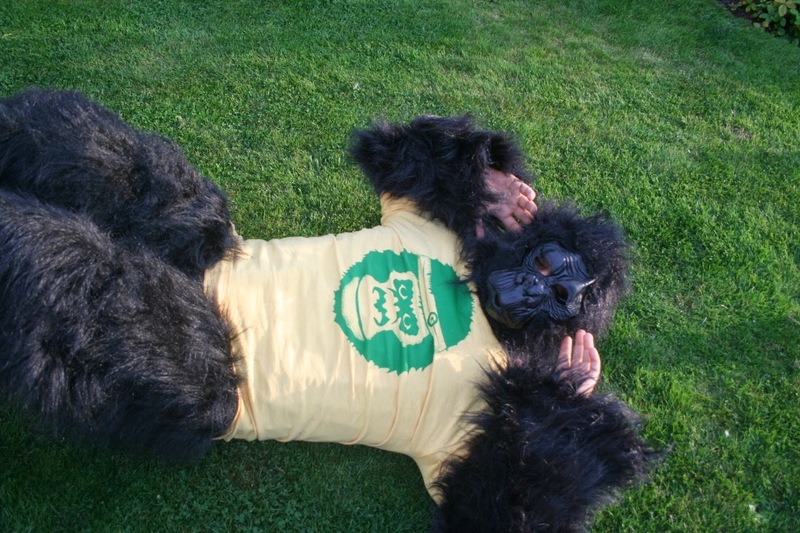 I will try to keep a monkey theme to the recipes. As a lot of people always ask me where I get my protein from I thought I would start with a high protein snack. When I first tried these balls I was astounded with two things. 1, the amazing taste & 2, how easily they apparently were to make. One week later I gave it a go and I can honestly say it was actually very easy indeed. You can also mix and match the seeds and nuts you use, so it is a quite versitile recipe that you can adapt to how you like it. I only had ground almonds so that was my nut base, and I used a mix seed pack containing Pumpkin, Sunflower, Sesame & Linseeds. As I didn't have raw Cacao powder I used Coco, but I doubled the quantities as it is not as strong. When I had finished making the balls I rolled them in desiccated coconut; just cause I love coconut. Then an hour in the freezer to help them firm up. I have been advised that if stored in a container they can keep for up to six weeks in the fridge. This recipes origins come from a food blogger named "Delciously Ella" and this link will take you to the recipe. CLICK HERE. Why not give it a go and let me know how you get on; a picture would be great. 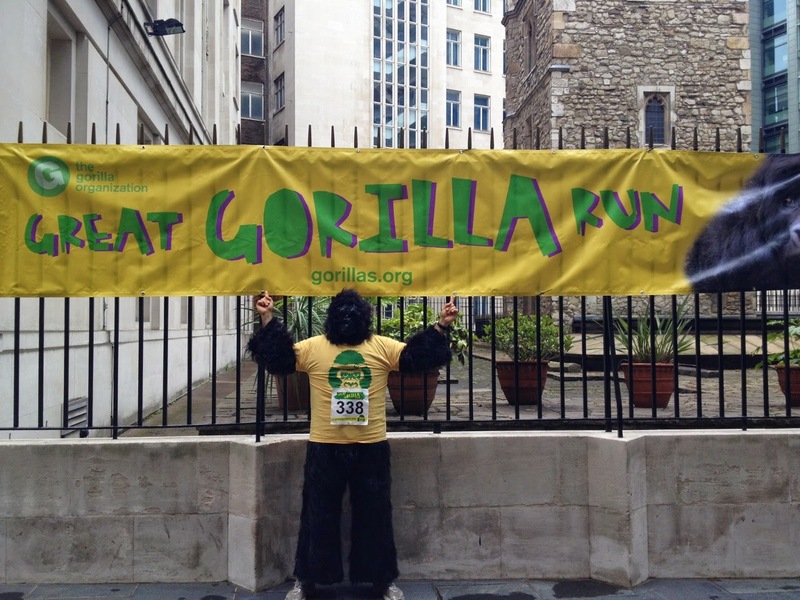 If you see a gorilla, RUN! 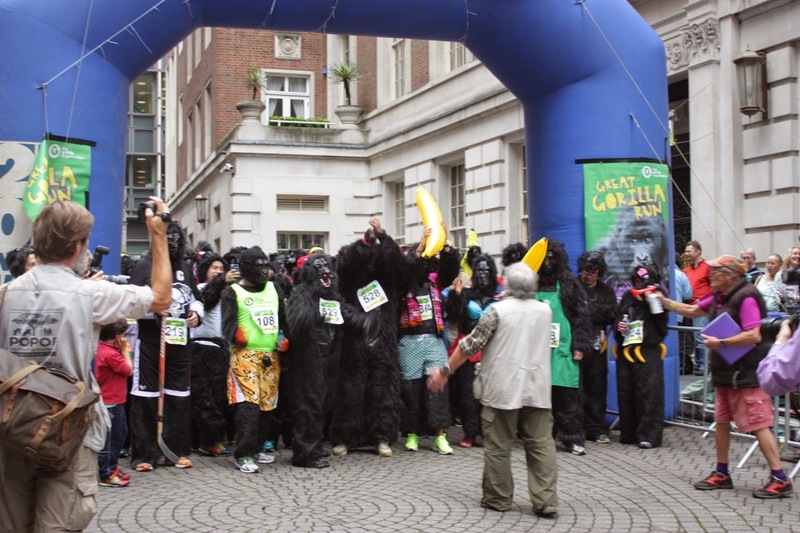 Yesterday I took part in the 11th Great Gorilla Run (GGR), an 8km fun run through the heart of London to raise money for The Gorilla Organization. 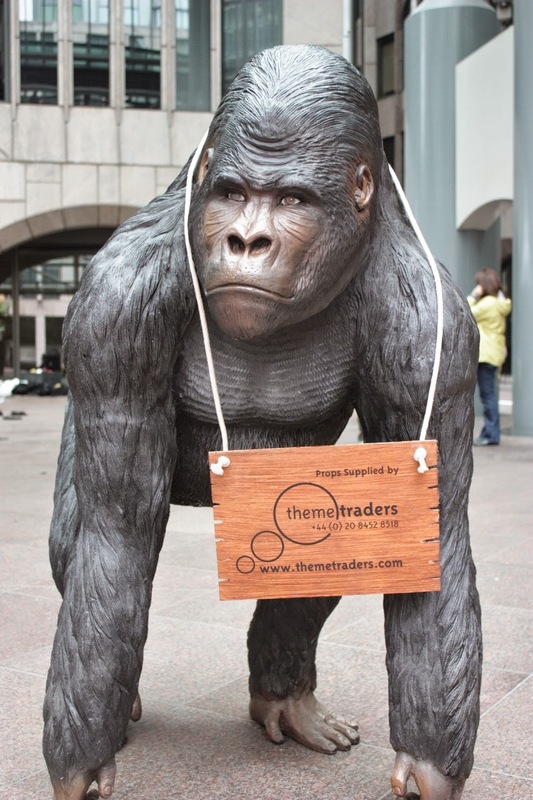 Over 500 people had registered and I was very excited at the prospect of being part of this amazing charity event. 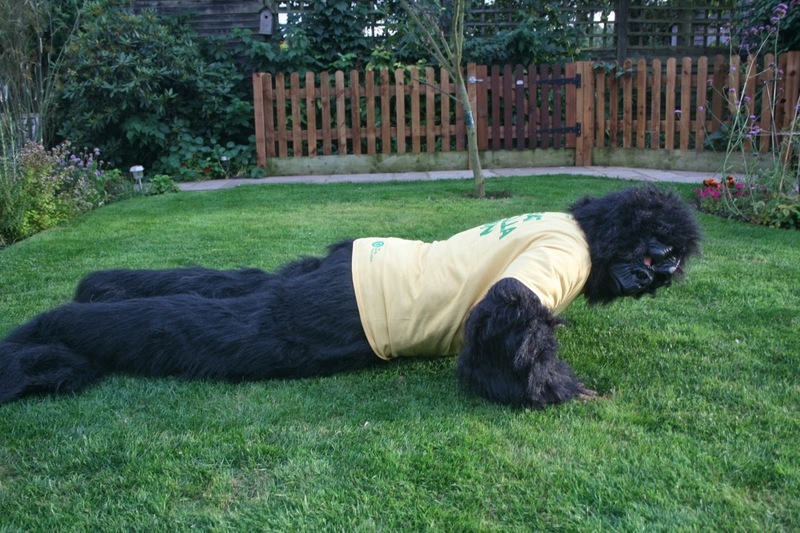 After arriving back in England I began doing some runs wherever I could and I felt good about my fitness levels; then the gorilla suit arrived. 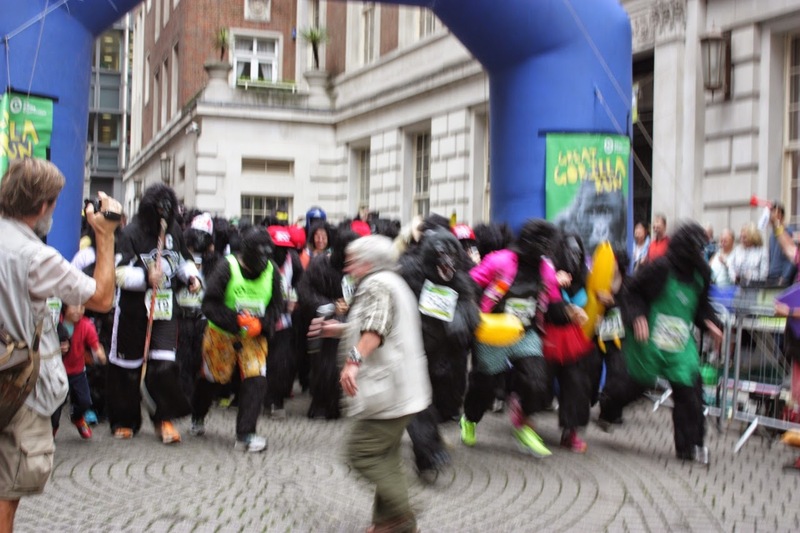 Of course 8km on a relatively flat level doesn't perhaps sound that challenging, but when you add a heavy, furry, unbreathable, thick gorilla suit it starts to look a bit more daunting. When trying it on for the first time you soon realise why people have commented on this so called "fun run" being more difficult than a half marathon. There is no where for your body heat to go and so you very quickly get sweaty and hot; this is going to be interesting. So four weeks had flown by and all of a sudden the big day was here. 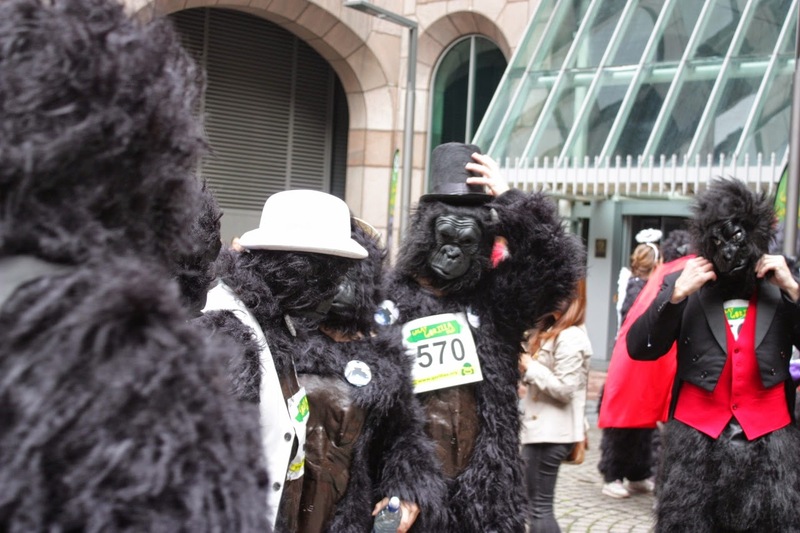 I arrived in central London (right by the Gherkin) at around 9.30am and there were already hundreds of gorillas warming up. 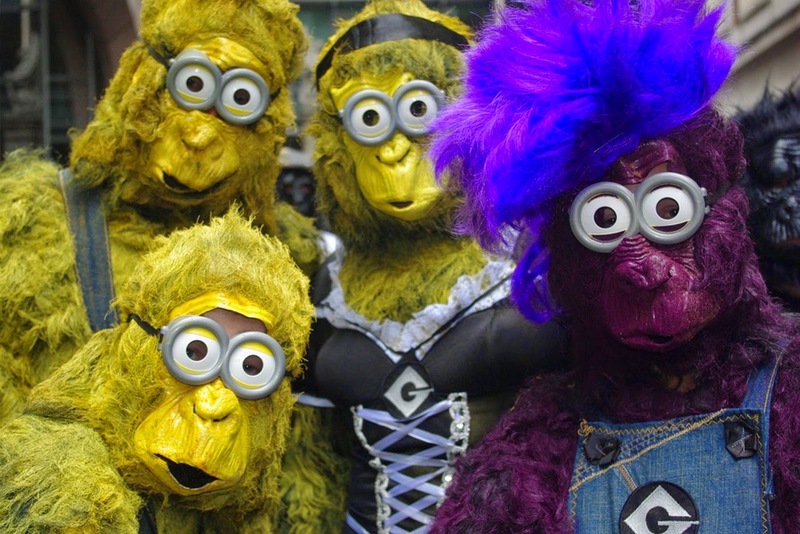 It was a very strange setting (like a budget Planet of the Apes film) and the different costumes that were appearing were fantastic. 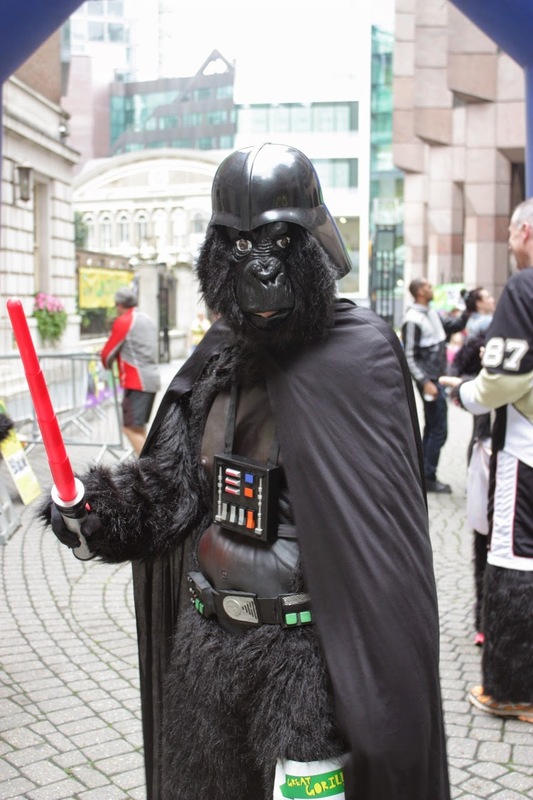 There was everything from just plain old gorilla to Darth Vadar, Lifeguards, Bikinis, Angels and Devils, big bananas, multi-coloured and everything in between; including a guy dressed as a gorilla carrying a human in a cage. 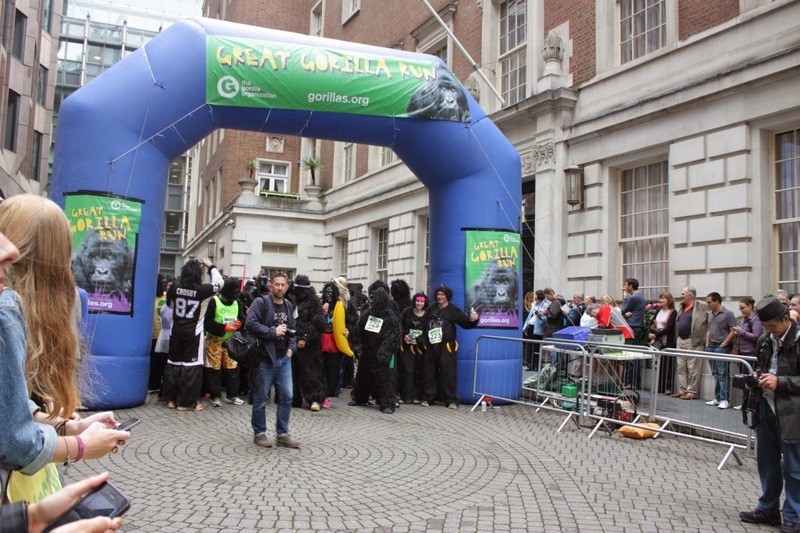 I was now feeling pumped so I dressed up in my gorilla suit with my GGR t-shirt over the top and running number attached (338 is me). 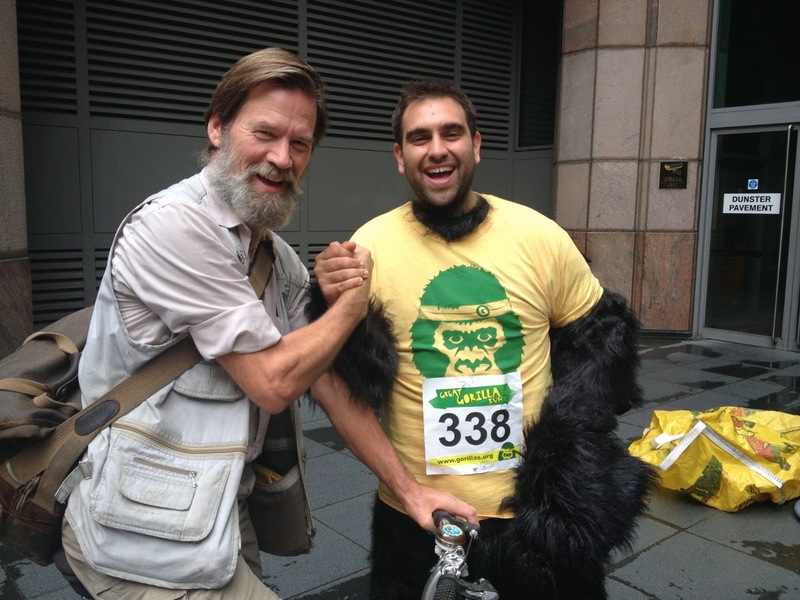 Then I headed to the starting point where I met Ian Redmond (chairman of the Gorilla Organization), this was a huge moment for me as Ian has been a hero of mine for many years. 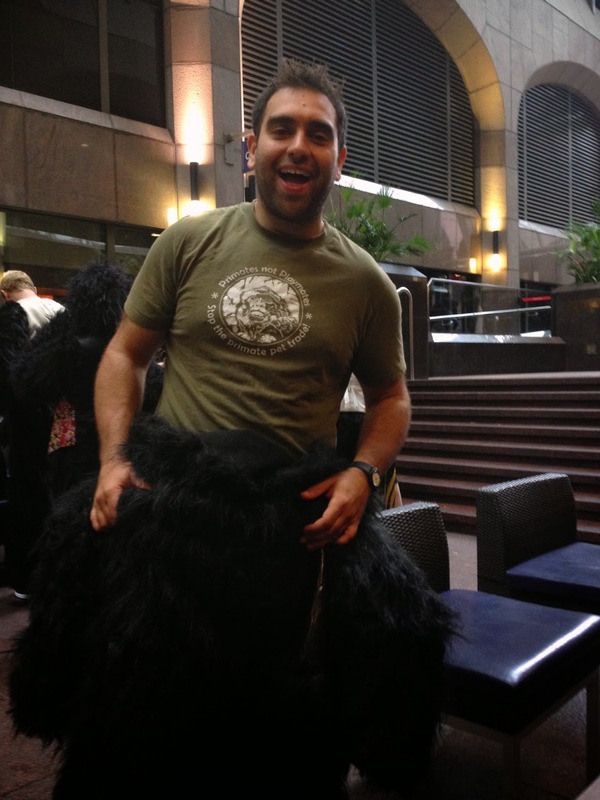 His work with gorillas, elephants and conservation is amazing and has created real change around the world. 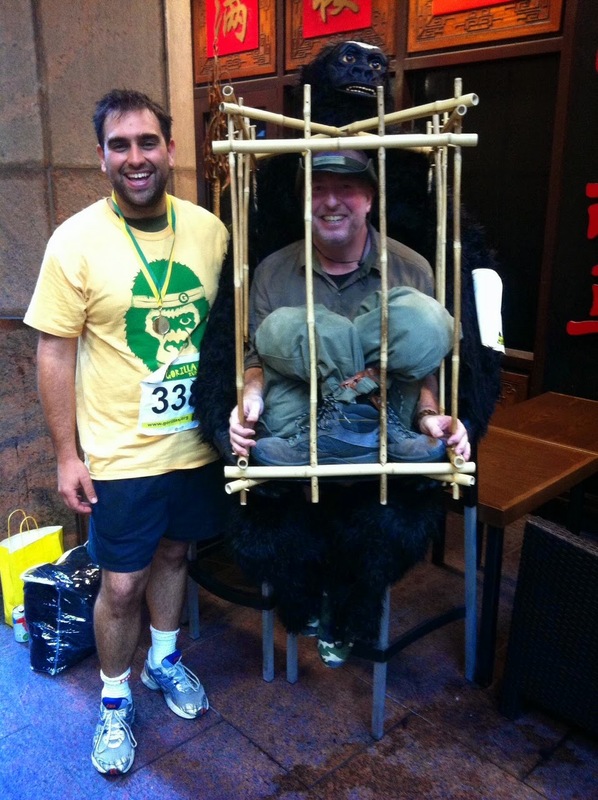 He was dressed in his traditional khaki shorts, shirt and sandals and I just had to get a photo. 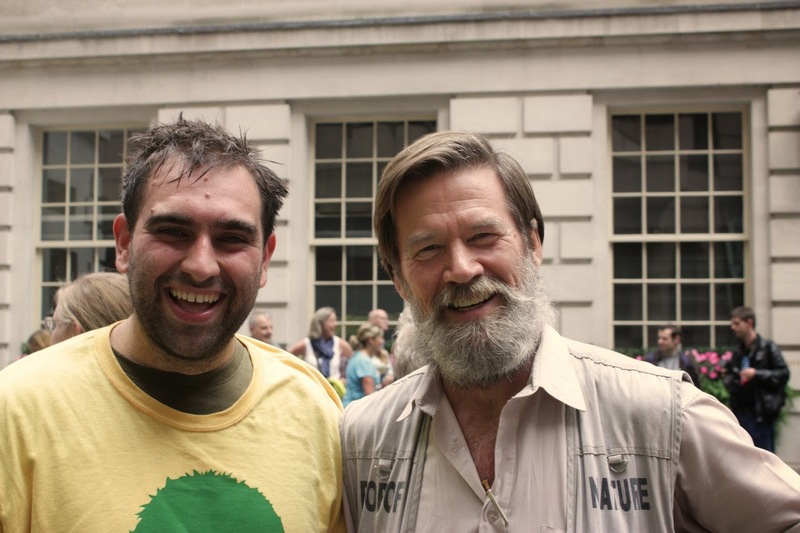 Then at around 10.30am we all gathered at the starting point and had some inspiration words (and spoon bending) from Uri Geller as well as the Patron of the GGR Bill Oddie. 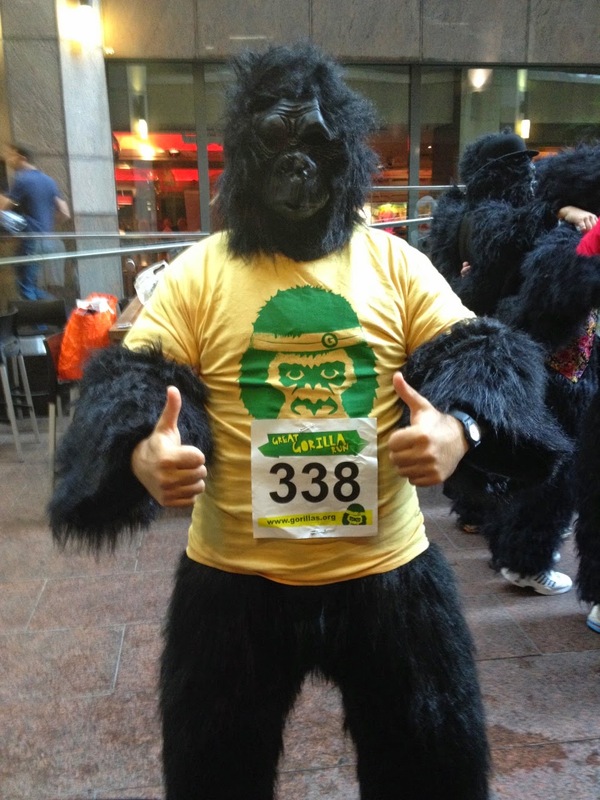 He then announced the start of the race, but was still in front of all the gorillas when we started; luckily he moved quickly out of the way and we were OFF! 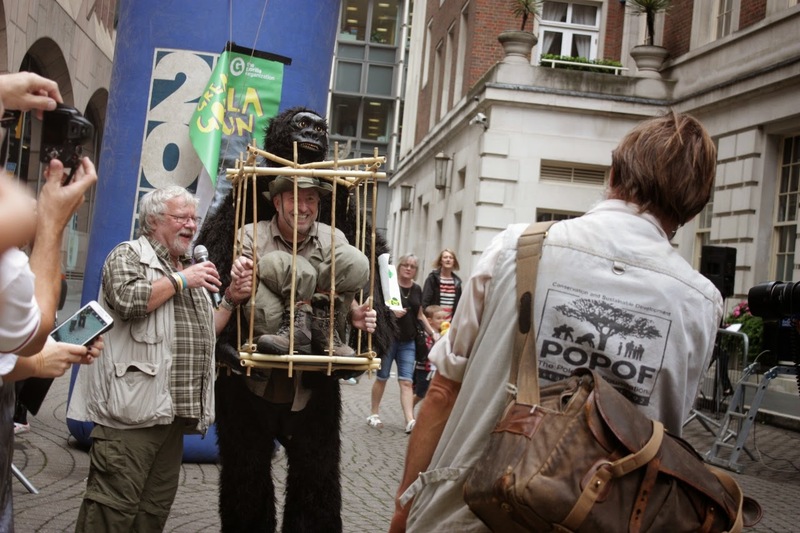 Bill Oddie saying Ready, Steady, GO! 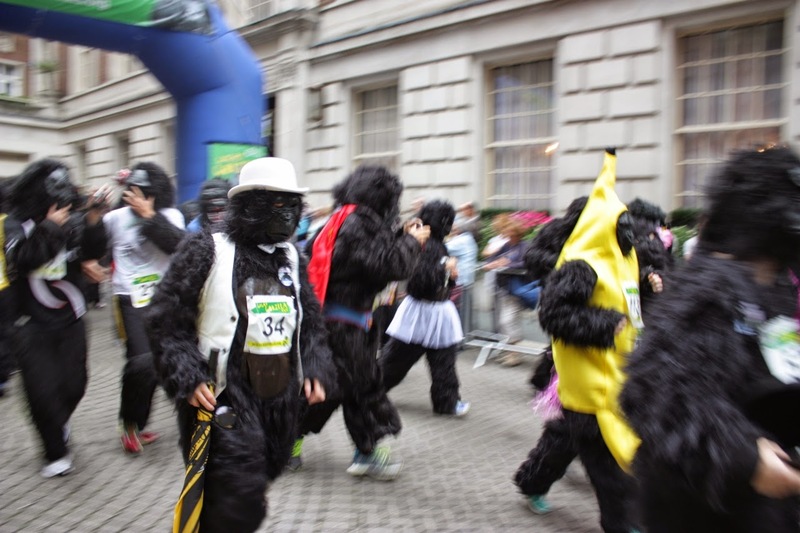 The crowd was cheering and everyone was having a good time making gorilla noises (some were very questionable) and getting into the spirit of the run. I quickly realised two things, 1. You can not see a thing out of the mask and 2. 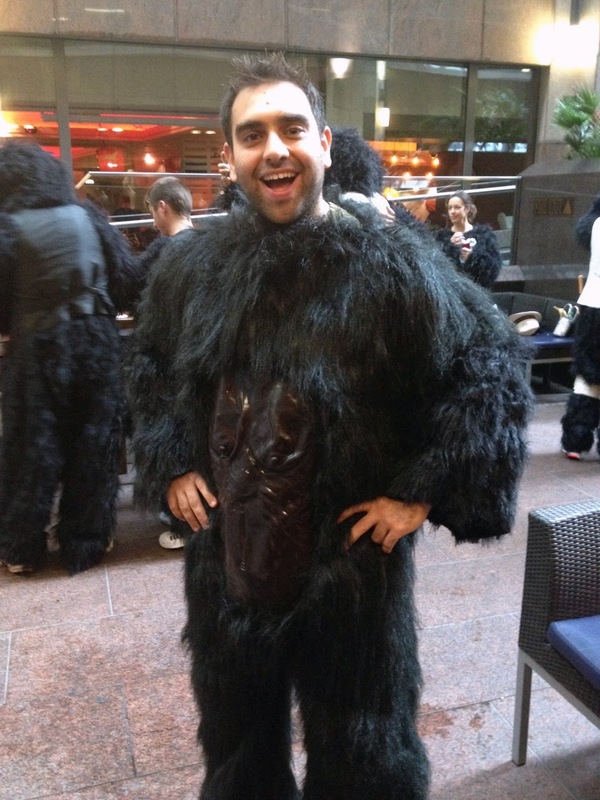 It got very hot inside the suit and mask very quickly. 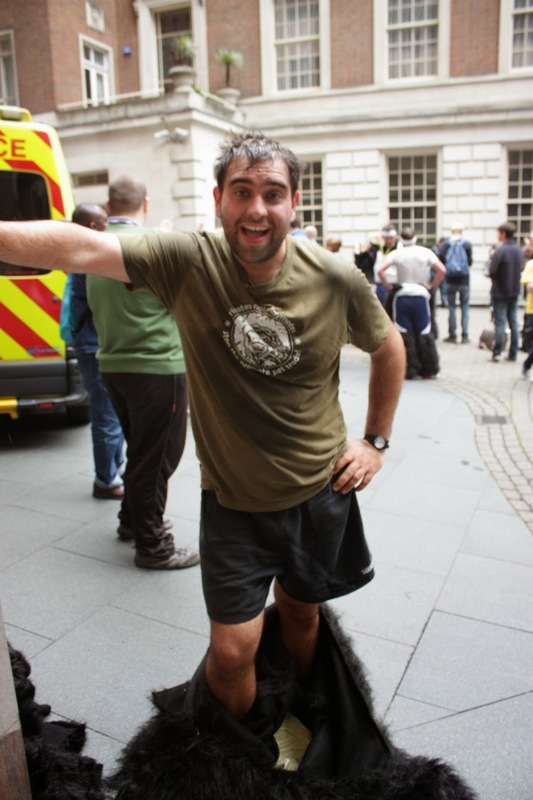 However, with the random waving tourists we were running past, car hooting and the sights of London around us I put that behind me and got on with the run. We went round the Tower of London where I saw all the poppies that had been laid out in the grounds, we then went underground before popping up further down and going over tower bridge to run along the south bank. 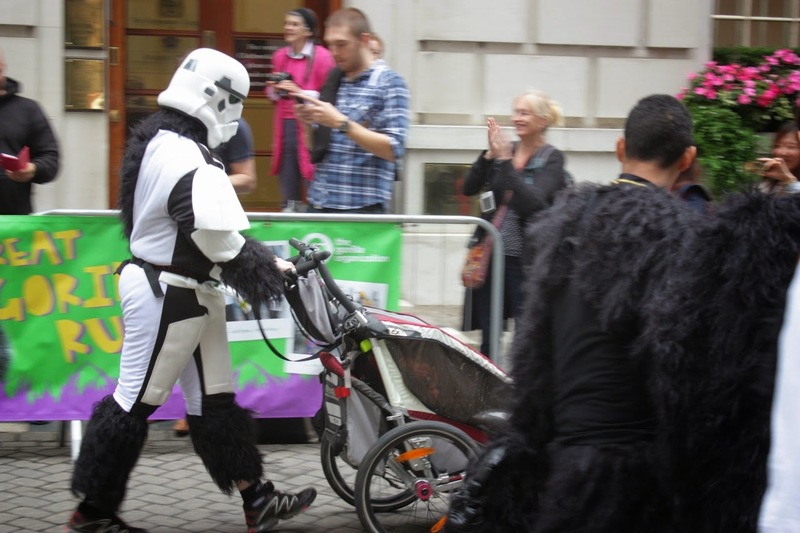 There were a lot of people taking photos and also wondering what the hell was going on; I overheard one woman say "that is what I love about London, always something going on". It had seemed like I was running for ages and then a marshal (who were all fantastic) mentioned that this is the halfway point. The random people constantly cheering me on (in many languages) did keep me going and it was raising awareness, which is always good. With the last km in sight I was really feeling tired and it didn't help going past the back of a big building that was pumping out heat. Then a marshal told me we were approaching the finishing straight and that last 500 meters was the hardest part of the race. 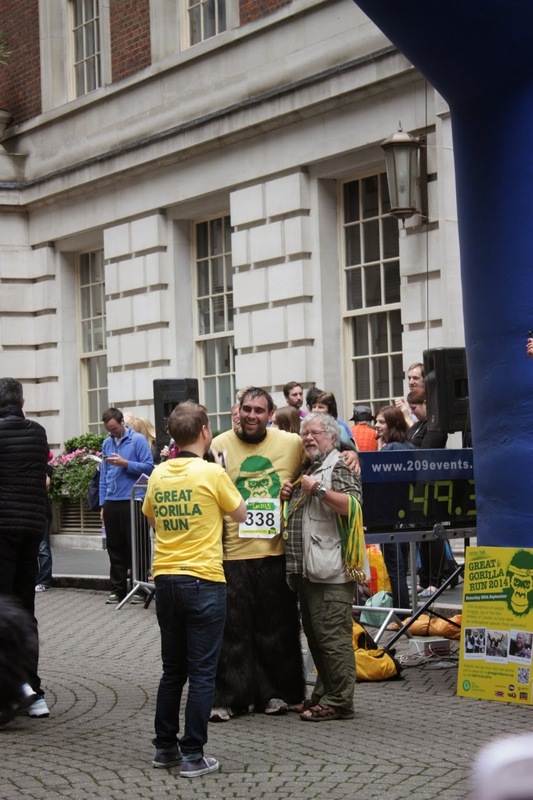 As I turned round the corner and saw the finish I picked up the pace, put my hands in the air, the crowd roared, the announcer read out my number and name and Uri Geller put a medal around my neck. 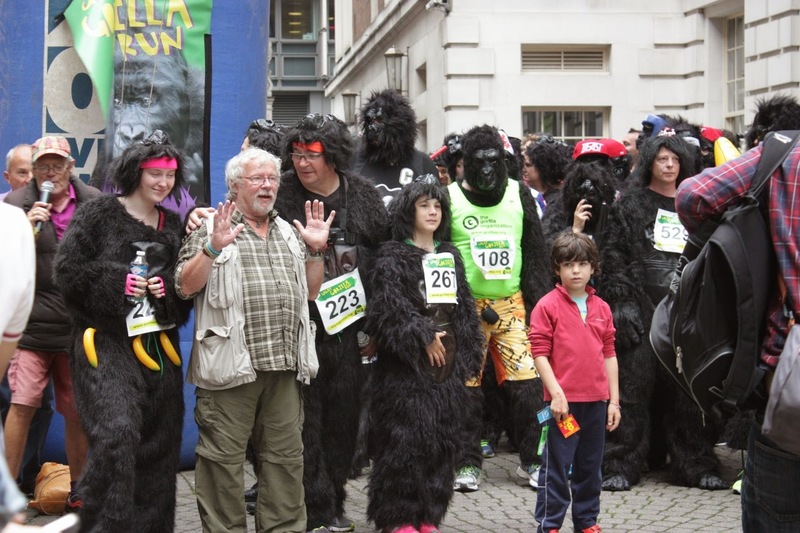 I was exhausted and extremely hot and sweaty, but grabbed a photo with Bill Oddie, another one with Ian Redmond and got the gorilla suit off as quickly as humanly possible. 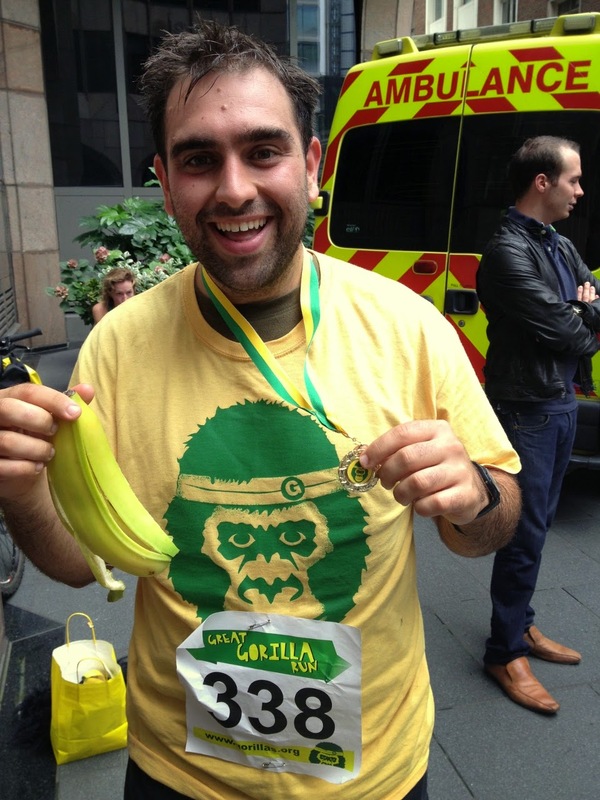 They gave us a goody bag containing a banana, coconut water and regular water, which was just what I needed. 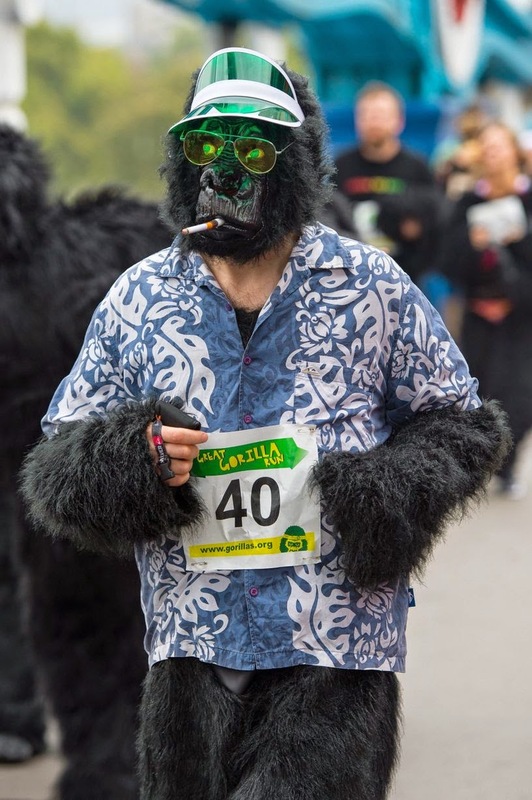 Luckily it was a cool, cloudy day and I started recovering quickly, it was amazing to watch all the different gorillas finishing. The atmosphere and environment was just fun, with drummers playing, music blaring and everyone just having a good time. I finished in 49 minutes and from the looks of it was in the top 30 to 40, but it is not a race and that is not what it is about. 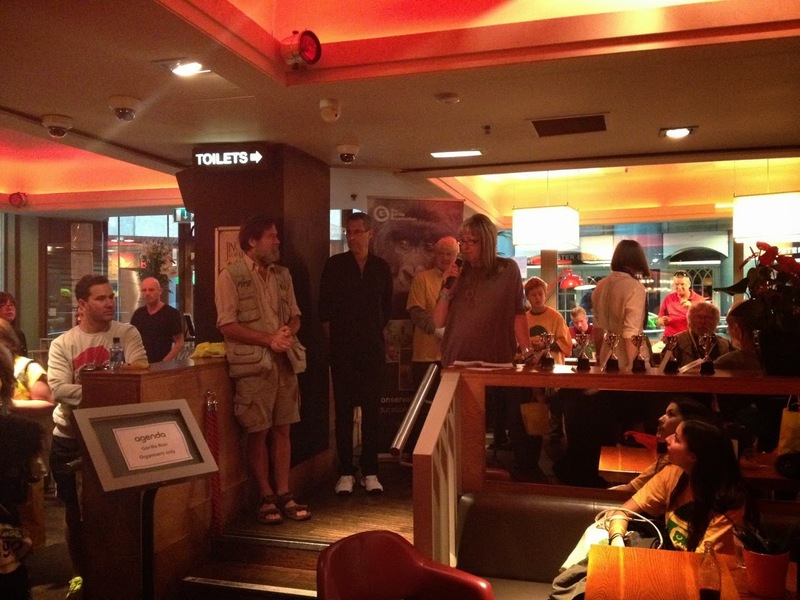 After about an hour of relaxing we heading into the bar area and had some words of congratulations by Bill Oddie who said "wildlife brings out the worst and the best in humanity and today we have witnessed the latter", Uri Geller "congratulations to everyone you have made a difference", Ian Redmond "gorillas are the gardeners of the forest and we must protect them to protect the forests they live in" and Jillian Miller the Chief Executive announced we had so far (donations accepted till November) raised £65,000 and said "the money you have raised today will go a long way to making sure we continue the fight to save the remaining gorillas in Africa". Prizes were given out for best dressed male and female, largest group and best training video; notice no prize for first place. 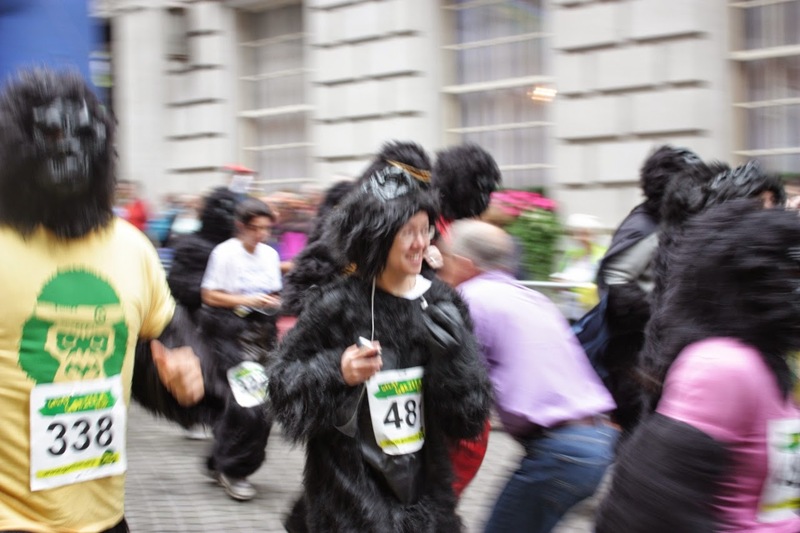 This really is a fun run and everyone is encouraged to participate. All in all I had a tremendous day, meeting great people, having fun and participating in an event that makes a real difference. A little bit away from my usual posts so apologies for that. 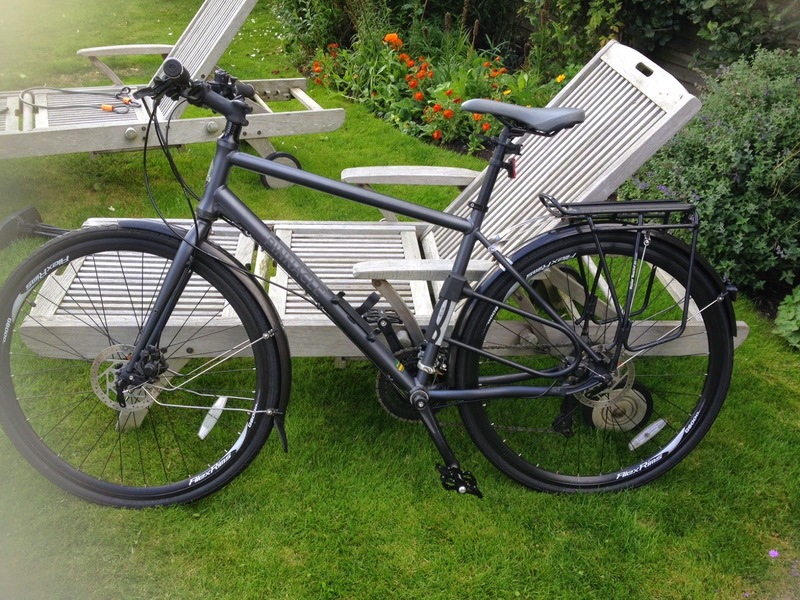 I am selling my bike due to the fact I don't use it, especially since I am temporally living in the country where unfortunately a car is a necessity. 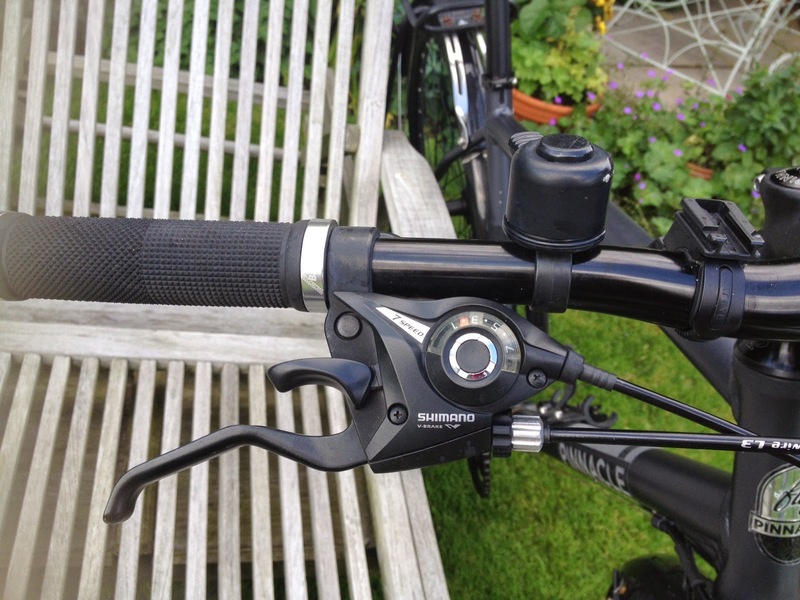 It is a Pinnacle Lithium Two 2012 Hybrid Bike, with 3 main gears and 7 smaller gears within those three, in very good condition and is clean and ready for a new home. All of this new came to over £600 and I am offering it all for the low low price of £250, that's right you heard me only £250. 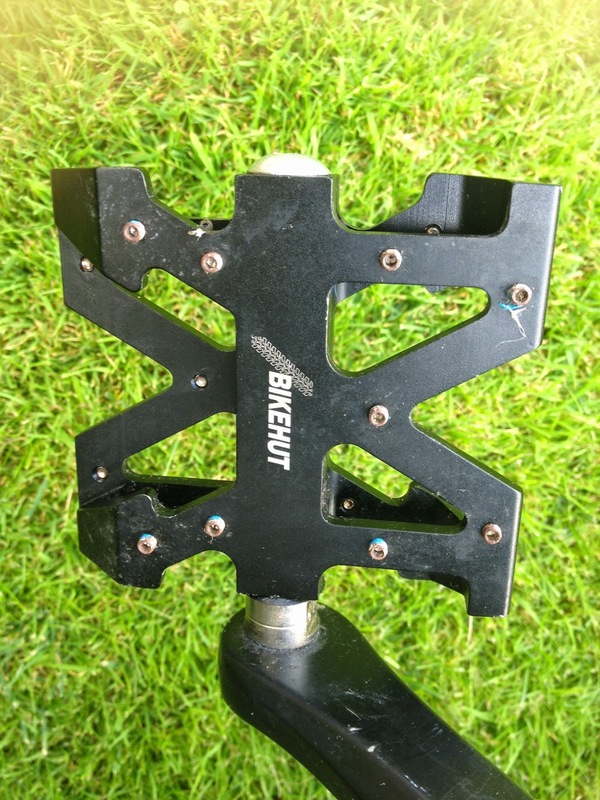 It is on a first come first basis and a courier change can be added if you cannot pick it up yourself. I am based just outside north London near the town of Hertford. Bike specifications and pictures below, if you have any further questions please don't hesitate to contact me through this blog or email me at lberman101@gmail.com. 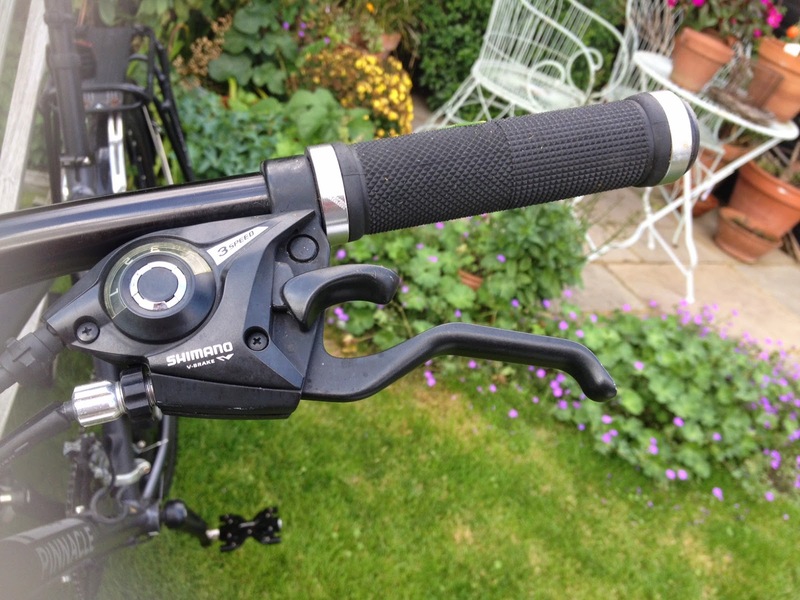 all-weather braking, plus a Cr-Mo blade fork for added strength with no loss of comfort. With big wheels and an attitude, the Lithium is a fast and light weight city ride with a heavyweight character. 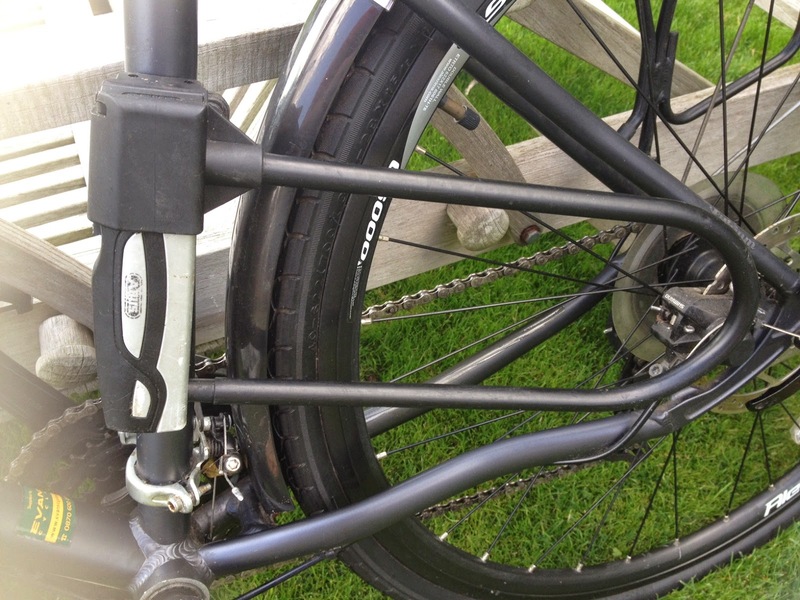 It’s based on a rigid 29er MTB layout for a confident ride position and designed with handling that suits the cut-n-paste of city short-cuts and emergency manoeuvres. Tough tyres, deep-section rims and a steel fork add to the security you’ll feel from behind the wide riser bar, while reflective frame decals help you stay visible in dimly-lit areas. It’s a true hybrid with the best elements of 29" MTBs and 700c urban genres rolled into one bike. 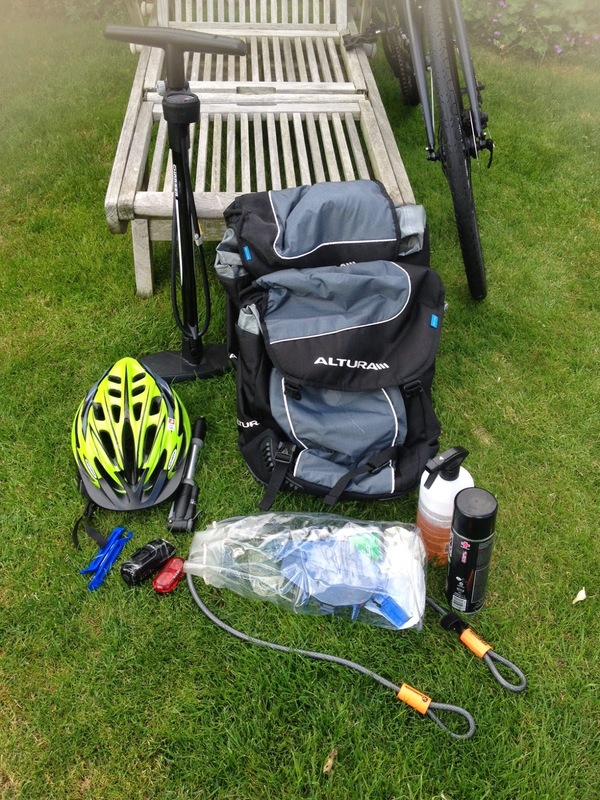 Most of the accessories the bike come with, extra lock on the bike, jacket and gloves not in shot. Thank you for reading this post and if you know anyone that might be interested please pass it on. Fish nets don't just catch fish! Just 72 hours after witnessing beautiful green turtle hatchlings racing from the beach to the ocean I get to see a full grown adult. 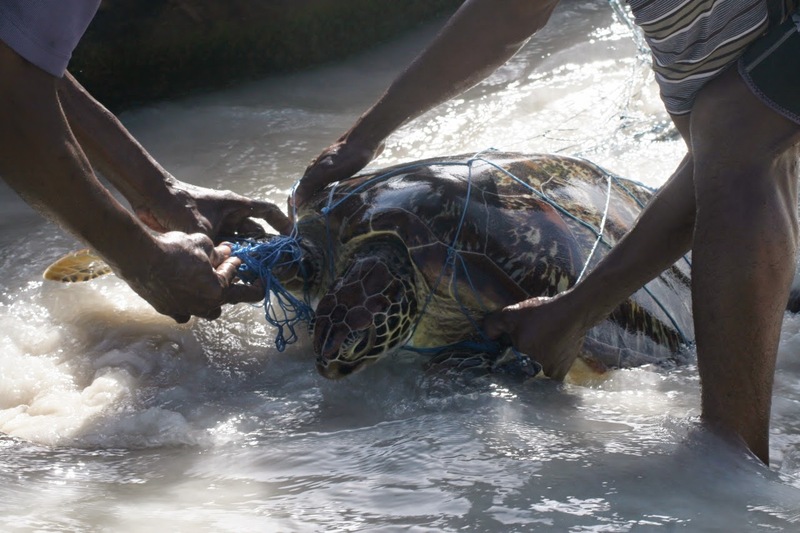 Unfortunately this encounter happened because a fisherman had been night fishing and two had got caught in his net. 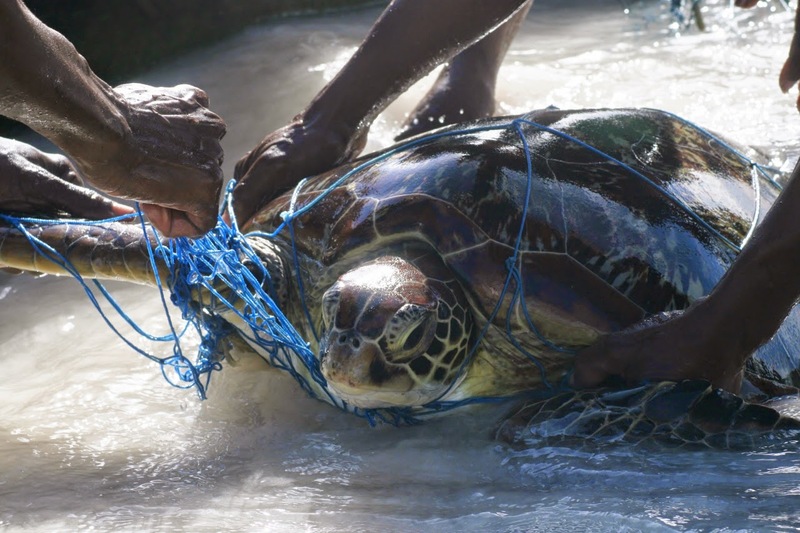 Luckily our Director is passionate about turtles and has been telling the fisherman that if they cut them free she will pay to repair their nets. 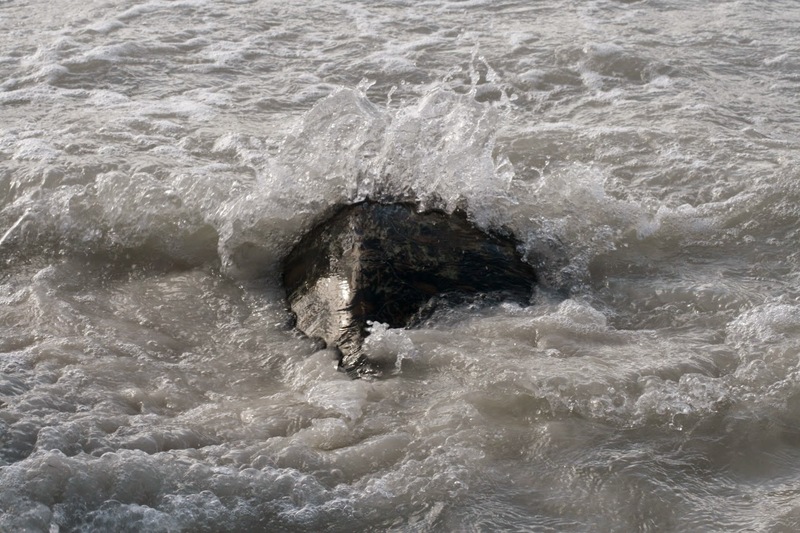 So after hearing about these turtles I race to the beach, fling my shoes and socks off and run into the water getting my trousers soaking wet in the process. 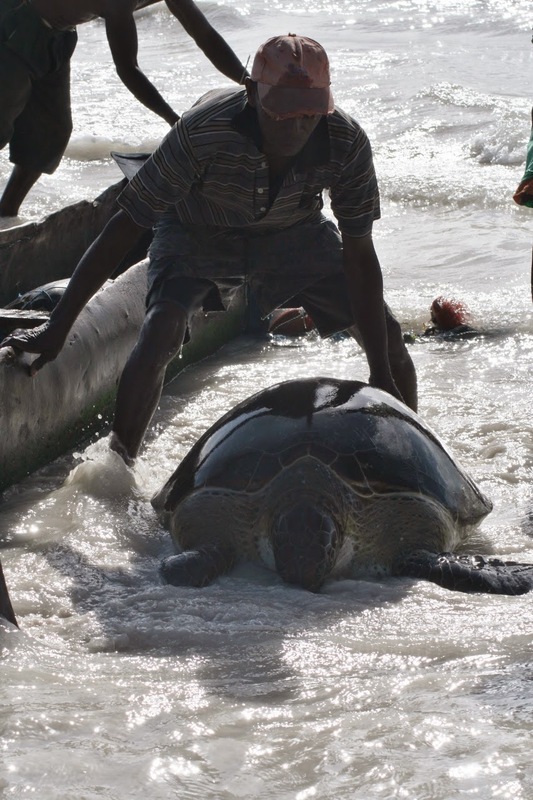 My first thought was, WOW that is a massive turtle and I couldn't believe they can go from being so small to so big. 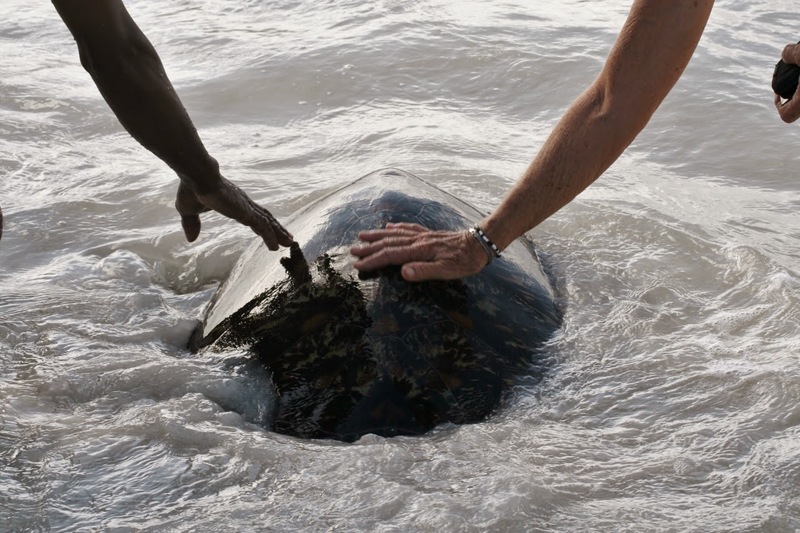 This guy had already had the netting cut from around it and was being released back to the ocean. 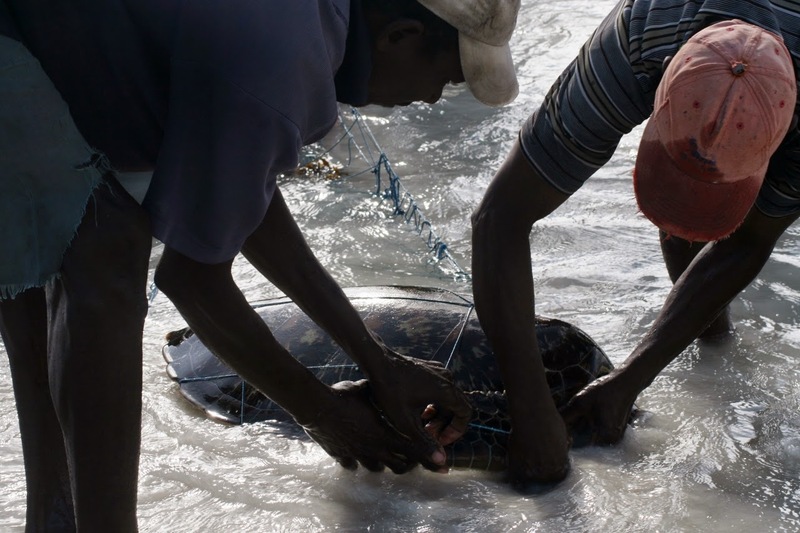 Then a slightly smaller turtle was brought out of the small wooden boat and was heavily entangled in plastic netting. 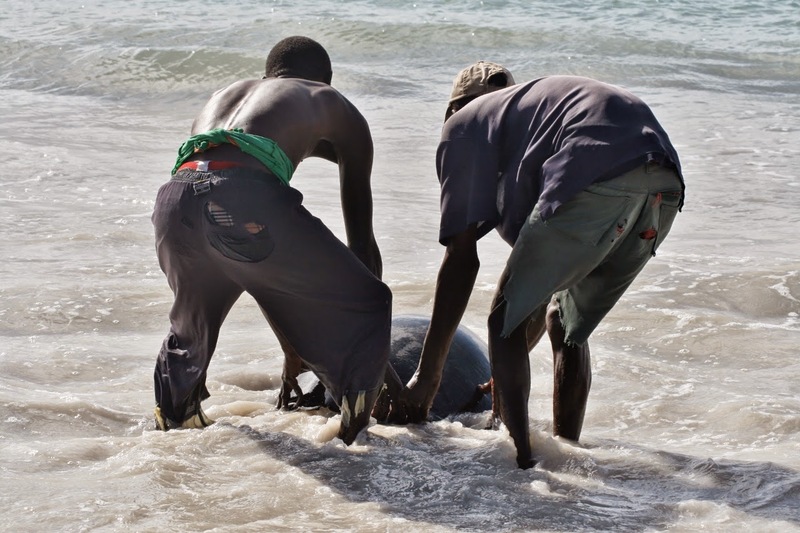 The fisherman worked hard to cut the turtle free and within 3 minutes they had succeeded and away it went. 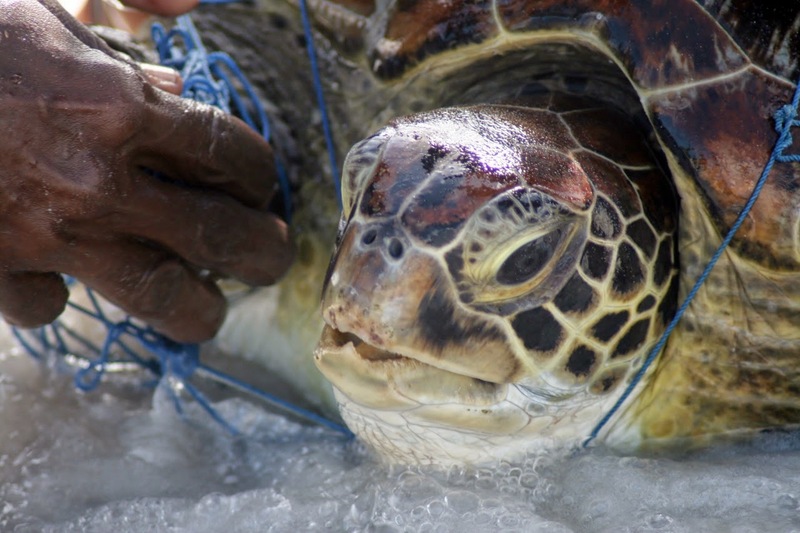 This is an example of how education and incentive within the local communities can help save precious species from decreasing.